People are often promoted to the role of a supervisor because they have the ability to meet production targets and have had suitable technical training. However, that does not necessarily mean that they have completed training to enable them to become successful supervisors. This booklet aims to help people new to this role, and also refresh the skills of those who have been supervisors for some time. Supervisors are key to managing hazards and risks in business. Businesses put ‘barriers’ in place to stop a hazard becoming an undesirable outcome, and rely on their employees at different stages to highlight any problems. A supervisor has a crucial role in this process, to make sure that employees talk to each other about hazards, and that any problems are highlighted. If there is a lack of supervision then these barriers become difficult to implement and maintain. Plan the work in sufficient detail. Do the work so it is completed according to the plan. Review what happened, learn from problems. Feedback, what went right and can be done better. Inform people outside the team about any learning points discovered. 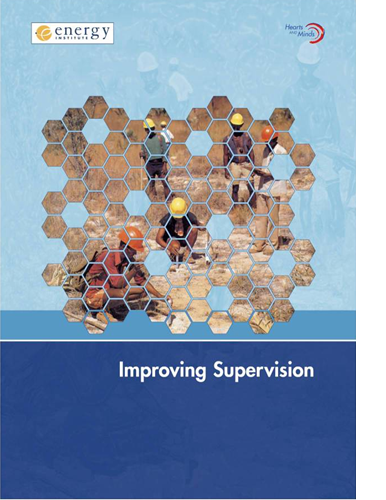 The Improving supervision booklet provides a step-by-step process to identify problems with the quality of supervision, and drives improvement. It also helps supervisors understand their leadership styles and how their working style is perceived by the people they manage. Six worksheets are included within Improving Supervision; they can be re-used, but additional copies can be ordered separately. Use Improving supervision to develop supervisors. Conduct periodic training sessions with supervisors based on the Improving supervision booklet, and encourage supervisors to apply what they have learnt in everyday operations. Ensure this isn't just a 'one-off' exercise – continuous development of supervisors is vital.